In Egypt, A New Courtroom Drama Every Day : Parallels Two ousted presidents, journalists and many activists are all on trial in the overburdened court system. Many cases stem from the country's political turmoil and there's no guarantee of a fair trial. 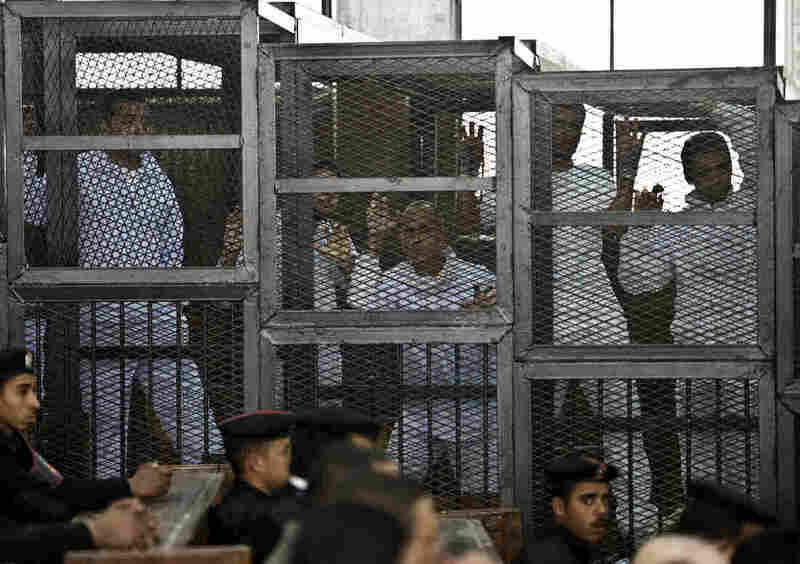 Australian journalist Peter Greste (center) of Al Jazeera and his colleagues stand inside the defendants' cage during their trial for allegedly supporting the Muslim Brotherhood at Cairo's Tora prison on Mar. 5. 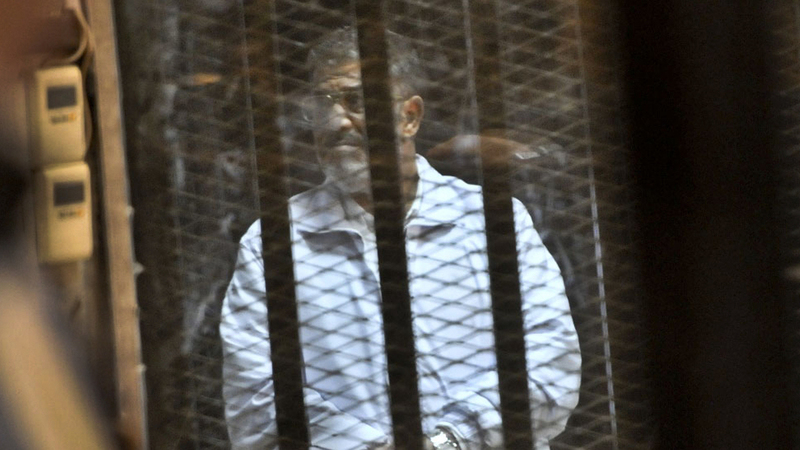 The most prominent defendants are Mubarak, who's free pending the verdict of his retrial, and his successor, Mohammed Morsi, the democratically elected Islamist who's hauled into the same courthouse every week caged in glass like a zoo exhibit. Egypt's overburdened court system is simultaneously dealing with many more trials that are linked to the military's sweeping crackdown on activists and the Muslim Brotherhood following its ouster of Morsi last July. Morsi's reversal of fortune has been nothing short of dramatic. The first freely elected president in Egyptian history was abruptly ousted in a military coup and held incommunicado for weeks, only to reappear in court wearing a prison jumpsuit. He faces charges related to murder, inciting violence, spying, a prison break and insulting the judiciary. Human rights groups have sharply criticized the case, saying it is based on politics, not law. Critics also say that Mubarak, corrupt policemen and beneficiaries of the past regime are largely getting off under a system that does the bidding of the people in power. Egypt's ousted President Mohammed Morsi stands inside a glassed-in defendant's cage on Jan. 28 during his trial on charges related to the prison breaks at the height of the 18-day 2011 uprising against his predecessor Hosni Mubarak. "The joke in Arabic is that the public prosecutor is not a public prosecutor, he's a private prosecutor for whoever is holding the presidency in the country," says Amr Shalakany, an associate professor of law at the American University in Cairo. "And that has been the role of the prosecutor's office certainly since the last three years, but also before the revolution." And right now it's the military that is in control. The biggest difference between Mubarak and Morsi's cases, Shalakany says, is that with Morsi, the security services and prosecutors are quickly building cases against him as well as against Islamists, critics of the state and journalists. With Mubarak, they dragged their feet. The images and videos that come out of the makeshift courtroom in suburban Cairo are fleeting and carefully chosen by the military-backed rulers. In a rare clip with sound from the courtroom, Morsi appears bewildered as he looks around the prosecution cage. "Where am I? Who are you?" he yells. Unlike the original case against Mubarak, Morsi's hearings are not aired live and only snippets from the courtroom reach the public. The cage is present in every Egyptian courtroom and sometimes defendants have used them as a soap box. Al-Qaida leader Ayman al-Zawahiri famously lectured the court during a mass trial of Islamists in 1982 and that tradition continues. From the prosecution cage, young activists and Islamists have yelled about torture, journalists have called for their freedom and Morsi has declared that he is still the legitimate leader of Egypt. Nathan Brown, an Egypt expert at George Washington University, says the courts are overburdened and the cases being tried reflect the widespread demonization of the Muslim Brotherhood, which has been declared a terrorist organization. 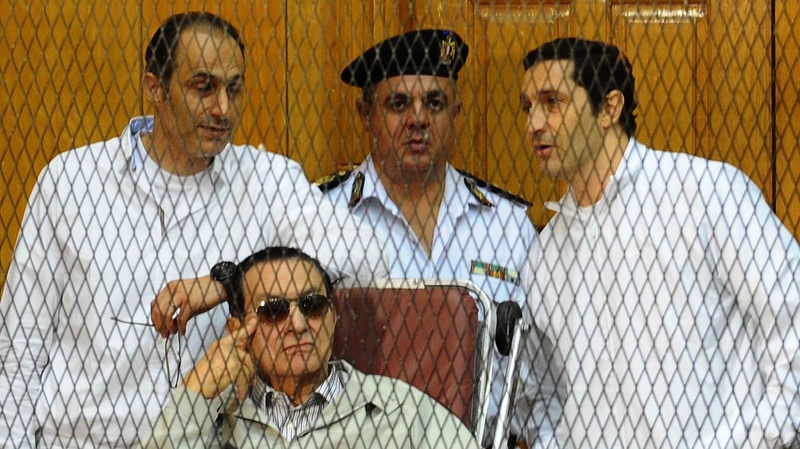 Hosni Mubarak (seated) and his two sons Gamal (left) and Alaa (right) stand trial in a courtroom cage in 2013. "I think any judiciary in any country would have trouble functioning in the kind of political atmosphere that exists in Egypt right now," Brown says. "It's really kind of a panicked atmosphere, so I would compare it say to the McCarthy period here in the United States. You don't expect courts to really always be able to stand up against a public wave — in a sense what they're doing is joining that wave." On the streets of the capital, that's evident. Ahmed Ismail stands outside his hardware store in suburban Cairo. "I don't care if Mubarak is released or not, I just want Morsi and his group to pay," he says. Ismail repeated conspiracy theories that Morsi tried to sell the Suez Canal and worked with foreign forces to destroy Egypt. But for others, the trials just mean more days of instability. Beshoy Meseeha, a water pump importer, says it is a never-ending game as the seats of power bounce from one place to the next. "We've gotten nothing out of these trials, the rights of the martyrs are gone," he said. "The revolution is like a ball that keeps coming and going. It is not stable. And every now and then someone new takes control and tries the people from before." "If you want to try them," Meseeha said of the former presidents, "do it in the desert, away from all of us. We don't care if it's in a glass or a metal or a stainless steel cage."